Do you remember the moment you were falling in love with your special someone? You remember it in detail, don't you? You probably even smile as you recall that moment. Well, I think those on the path to Allāh remember the moment they knew their heart was beating for something more than this world. It's the moment when everything else melts to the ground and all your heart wants is Allāh; to know Him and to love Him. Everyone's starting point to Allāh is different but sooner or later, everyone returns to Him. Inna lillahi wa inna ilaihi raji'un. To Allāh we belong and to Him we return—but if you're fortunate, it doesn't take death for you to be with Him. I've met so many people who have shared stories of their spiritual journeys with me and I can appreciate the beauty in each and every one of them. There are small minds that make it seem that the only ones seeking Allāh is the woman with the long hijab reaching her navel or the man with a beard that wears baju Melayu or a thobe all the time. Or worse yet, they think only Muslims who abide by their standards are deserving of His Mercy when the truth is, the human mind cannot comprehend Allāh's Mercy because we ourselves, do not dispense mercy the way that we should. We are neither Al-Basir (All-Seeing) nor Al-'Alim (All-Knowing), so we can never know where a person stands with Allāh. We all have preconceptions of how a God-fearing Muslim should be but the affairs of the heart are mysterious and we can't always make accurate judgments on what we see on the outside. We can only make assumptions. This religion is for everyone who bears witness that there is no god but Allāh and Muhammad ṣallā llāhu ʿalayhi wasallam is His Messenger. How a person conducts their journey towards Him is none of our business because we don't know their stories, we don't know the mysteries that lie within their hearts, only Allāh does. Have you ever met people who you never thought could change 180 degrees and yet they did just that? Sometimes, Allāh opens the hearts of His servants through the things they love whether it's the birth of their first child, a life-changing friendship or even the affection of a pet. For me: it was the power of poetry. A very specific poem by a specific poet. we are His drowsy ones. we are His cloud full of raindrops. we are His lightning in that moment. it is the reflection of His wrath. it is the reflection of His love. I still remember the moment I heard that poem being recited; every word stuck with me. It filled a spiritual cavity inside of me I never knew existed. In that moment, I felt Allāh so close to me. I felt small, like a completely defenceless speck but at the same time, I felt completely liberated. I felt loved. And I felt secure knowing that I depended on Allāh, whose Mercy encompasses all. Underneath the sudden rush of serenity, my mind was buzzing with so many questions. Questions too big for a 16-year-old, who up to that moment, was going through depression and thought her life would be perfect if she had good grades, studied in a prestigious university, had a flat stomach and gained the approval of those in her circle even if she did feel out of place. WHO AM I IN THIS COMPLICATED WORLD? If I claim اشْهَدُ انْ لّآ اِلهَ اِلَّا اللّهُ وَ اَشْهَدُ اَنَّ مُحَمَّدً اعَبْدُه وَرَسُولُه what am I actually doing to embody that? And then, the search to discover who the mysterious Rumi was began. I headed to Kinokuniya KLCC to grab any book I could find on Rumi. At that time, I didn't know what to look for so I grabbed the first book that I set eyes on. The book I got was amazing; it contained both his prose and poetry with commentaries on each page. Since then, I've lost the book and I've no idea what the title was or who translated it. But even that was a blessing in disguise because I found many more great books on Rumi while searching for the one I lost. So, I discovered a few things by the end of the book: Rumi was Persian, a Muslim and his poetry were inspired by his relationship with Allāh. Fast forward to this day, I know even more about Rumi. 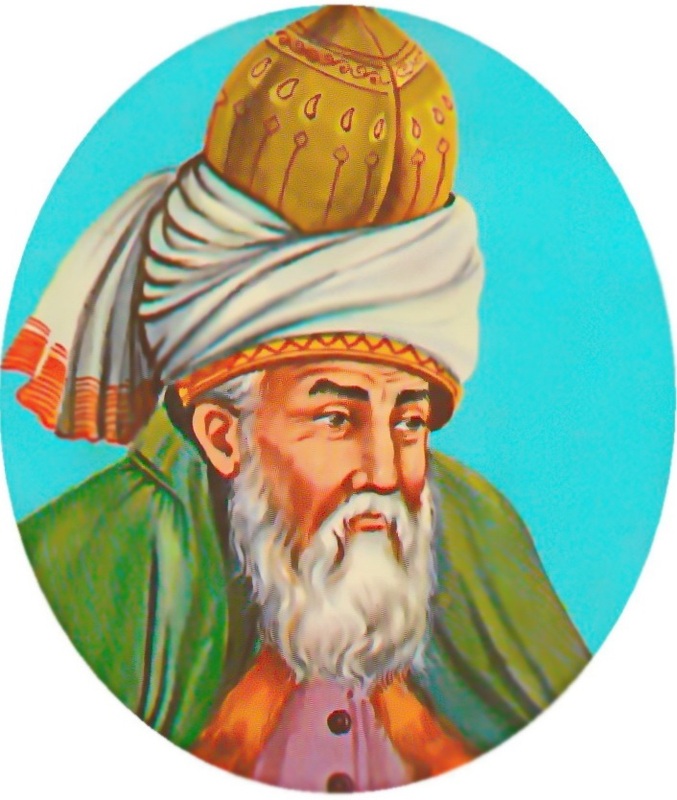 For starters, he was a great scholar and jurist whose full name was Muhammad Jalāl ad-Dīn Rumi. He issued fatwas and gave sermons in the masjids around Konya; people would travel far and wide just to hear him talk. He had a teacher and close spiritual companion called Shams-i-Tabrīzī; Rumi experienced indescribable grief when Shams was murdered. Every time I looked at the footnotes, it would include a reference to the Quran. So many of Rumi's poems were inspired by surahs in the Quran. Then, it hit me: I don't actually know what's in the Quran. I've khatam (completed) the recitation of the Quran but I never bothered to know what I was reciting—reciting the Quran as a child was just another scheduled activity. I did not realise how much of an honour it was to be able to read each ayat. Although Rumi's writings were a heart-opener, it was ultimately the Quran al-Kareem that reflected Allah's Light onto my path. My friend's father, at that time, just returned from umrah and bought an English translation of the Quran during his trip—I asked if I could borrow it. The first translation of the Quran I've ever read. It had a brilliant commentary—at times, I even cried reading it! I believe to fully understand the Quran you DO have to understand it in classical Arabic, the language it was revealed in. Languages lose some of the beauty in its meaning when its translated and classical Arabic is a treasure trove to be appreciated AS it is. However, for people like me who don't speak Arabic fluently, an excellent translation like the one above can still be of great help. It's no surprise that a bookish person like me appreciates poetry but do you know who else did? The people of Mecca and Madina during the time of Prophet ṣallā llāhu ʿalayhi wasallam. Every Nabi sent to the people were capable of performing miracles—for Musa ʿalayhi as-salām, it was magic because his people practised magic. For Isa ʿalayhi as-salām, his people excelled in medicine thus why Allah granted him the power to cure the blind and bring the dead back to life. During the time of Muhammad ṣallā llāhu ʿalayhi wasallam, poets were highly respected for their command in the Arabic language. The best poems used to be hung around Ka'aba and even leaders were afraid to mess with poets for they feared their reputation would be immortalised in a poem that would spread across the regions. Rasulullah ṣallā llāhu ʿalayhi wasallam's power was the Quran. When he delivered verses from the Quran, people were stunned by its linguistic perfection. So what did the poem 'Who Are We In This Complicated World?' teach me? "Know that the key to knowing God is to know your own self." The video above perfectly sums up what it means to know God by first, knowing yourself. Many people seem to pinpoint the start of my spiritual journey to the moment I donned the hijab or when I started travelling to Egypt. But truthfully, I'll always pinpoint it to that poem I read in the year 2008. The poem that changed my life. It was THE poem that kickstarted everything for me. But perhaps, because I previously did not fit the criteria of a God-fearing, super-religious Muslim, people assume that this thirst for ilm began very recently and abruptly. The reality is: ALL of our journeys to Him began since our first breath. Every moment since our birth is a build-up for what's to come. Nothing in our lives are insignificant, a coincidence or an accident; everything in our path was put there by Him. It's meant to shape us into better beings biidnillah. Don't ever think that just reading one page of an Islamic book is pointless. Don't ever think that a brief moment of contemplation where you questioned your life's purpose is insignificant. Don't ever think that remembering Allāh for a few seconds is worth nothing. Don't think that pang of guilt for doing something sinful is just an ordinary feeling. Don't even belittle having admiration for those that are ʿālim and more knowledgable than you. We never realise it but those 'moments' are all callings. It's Allāh giving you a nudge and redirecting your attention to Him. It's Him saying: 'Hey, come back to Me.' When you think of Him, it's really Him thinking of YOU because remember: only He can plant hidayah (guidance) into our hearts.